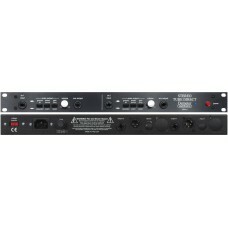 The Stereo Tube Direct Box (STDB-1) is a two-channel version, packaged in a single rack-mount chassis. It features all the sonic excellence of the Mono Tube Direct Box (VTDB-2B), plus the additional features of variable gain (up to 20dB) in the boost mode and low impedance, line level, 1/4" output jacks. This is the most versatile of our Tube Directs.